This yellow caterpillar was easily noticed as it’s walking on our black home fence. 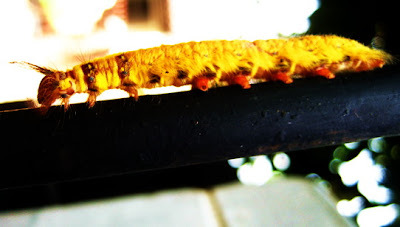 Since I’m afraid of caterpillars, taking pictures of a caterpillar wasn’t an easy job for me. Seeing it made me cringe! Do you? survived the weekend, comes again, after long absence. First time to see a yellow caterpillar. Great shots. He or she is so cute, isn't it ? haha..( just kidding.) At least it is God creature, right? I absolutely cringe! I'd love to say it's beautiful but something about caterpillars makes my skin crawl. 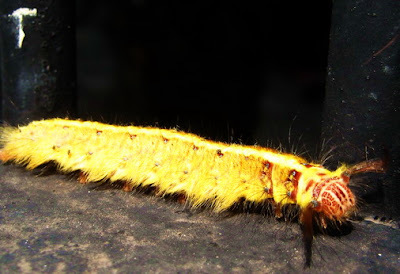 I've never seen a yellow caterpillar. I'm sure it will make a beautiful butterfly one day! My critter post, have a wonderful weekend! What a cute little guy. Nice capture.